Today is Monday and the plan for today is to travel back to Phnom Penh. We bought the tickets the other day for about $15 for both of us. At about 7 am we get picked up at the hotel. However, a number of seats in the bus are still not occupied and we go to the bus station close to the market to wait for more customers. Moreover, Reaksa forgot a pair of shoes at his friendâ€™s house and we need to wait anyway for somebody to pick them up. So we keep waiting at the station. 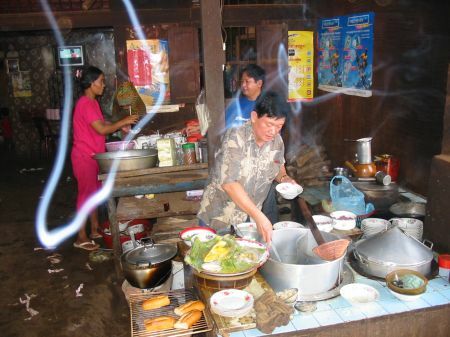 Children and women try to sell all sorts of snacks and soft drinks. 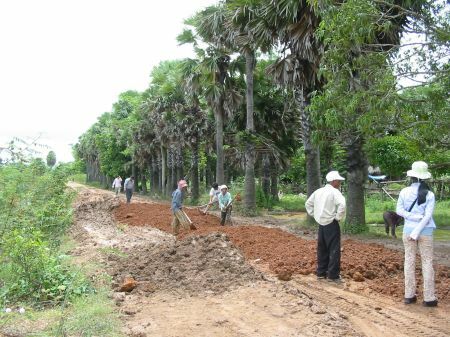 The following is my account of the third field trip to Kratie province. 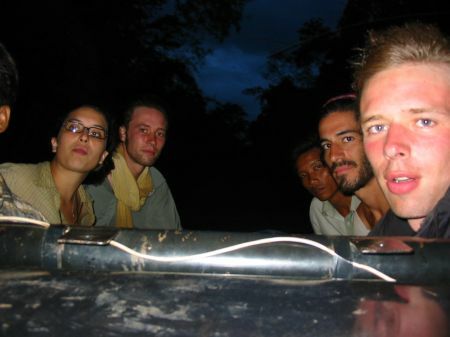 This trip took place some weeks ago and at this point it is already getting difficult to remember the details. However, experience tells me that I wonâ€™t do it later if I do not write it now. This is going to be a general report. Although I would like to incorporate details of my work and the research findings I wonâ€™t have the time at this point. In case somebody reads that and is interesting in an in debt account of my field work I am still more than happy to provide detailed minutes of my interviews. However, this is a tremendous amount of paper and most likely not very exciting for the average reader. 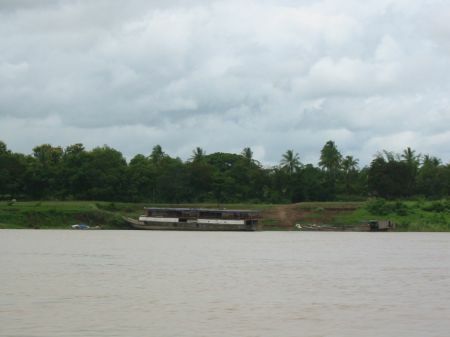 We decided to go to Kratie by mini bus, which is the way I got there for previous field trips as well. The way it works is that I get picked up with a moto by somebody who is send by the company which operates the mini bus. This is about 6:30 in the morning at Hun Sen Park, where police is still maintaining increased presence. 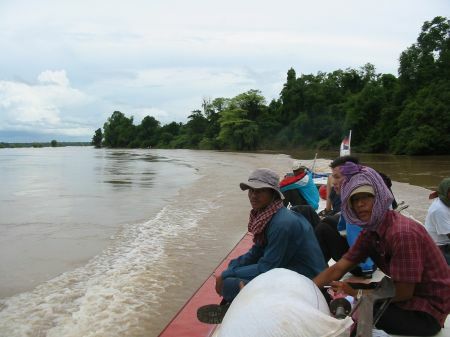 Next day we get up fairly early again to get the boat which leaves at 7 am to Kompong Cham. I have been traveling with those boats many times now and am getting used to it. And I still like it. 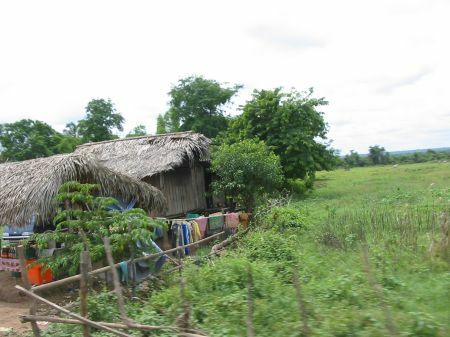 This is the report of my second trip to Rattanakiri. Unfortunately I did not even complete the article about the first one. Due to the fact that I am leaving tomorrow again I try to make this short and get it done quickly. It is not likely that I will find time after this field trip, since I will be busy analyzing the collected data and writing my final report. This leads to another consideration: I think it would be interesting to include reflections about my work in this article here. However, I will have to write my final report with exactly those reflections. Therefore, I do not want to double my work and make this a article primarily about traveling with more general information. I am more than happy to provide the countless minutes I take or my reports once they are finalized. For better readability I will divide this journey into a number of smaller reports. This time I went to Rattanakiri. I thought it would be a good idea to travel on the ground, particularly since I am here for only three month and cannot afford to spend so much time in the air. I divide this trip into more than one pieces and start off with our journey to reach Banlung. 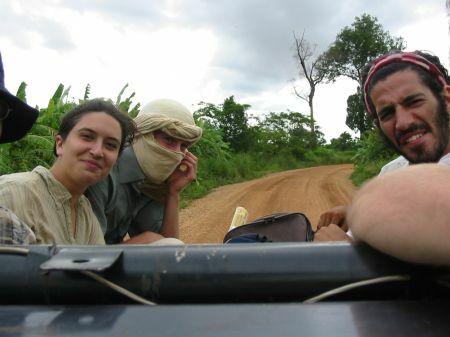 This time I was traveling with the Administrative Assistant of our project. He was so kind to give me company and help me out with translation. 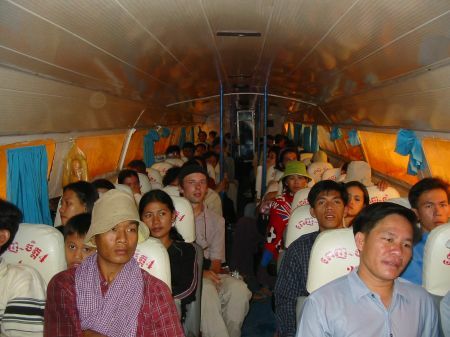 I had arranged the ride to Kratie via minibus the other day. 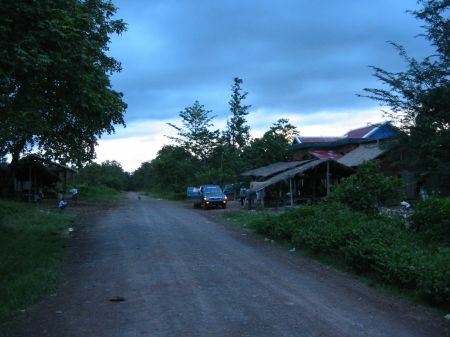 Kratie is about half the way to Banlung, which is the provincial capital of Rattanakiri. 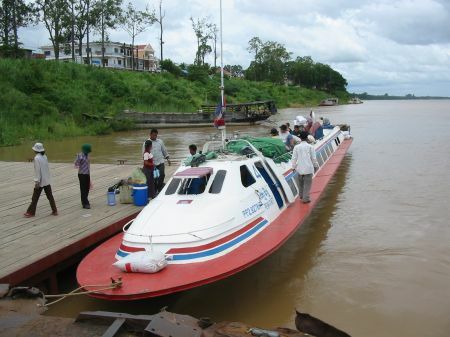 What we had to pay for the ride to Kratie was cheap 10 dollars per person. 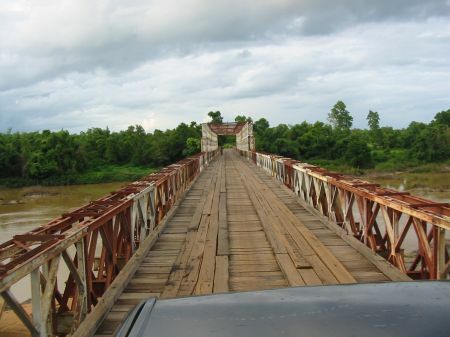 It was open how we would proceed from Kratie. 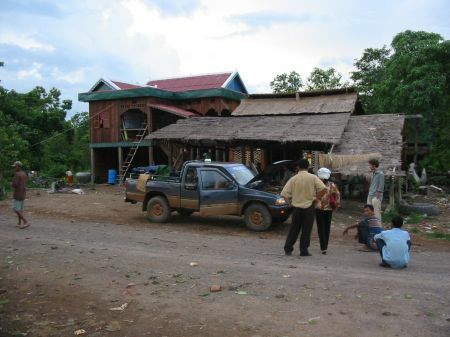 Our expectation was that we would have to spend the night there and continue the journey the next day to Banlung via Stung Treng. 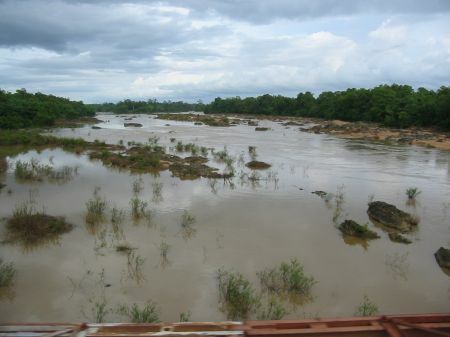 Stung Treng is half way between Kratie and Banlung and the provincial capital of Stung Treng province. We met at 6:15 am and went to the port by moto. We left at 7 am with the minibus. 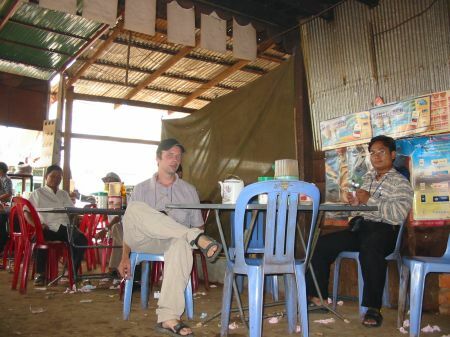 This is where we had food after we have been traveling for some hours and passed Kompong Cham already, which is the provincial capital of Kompong Cham province. The guy to the right is my co-traveler. This is our quite comfortable means of transportation. The guy to the right is the driver. 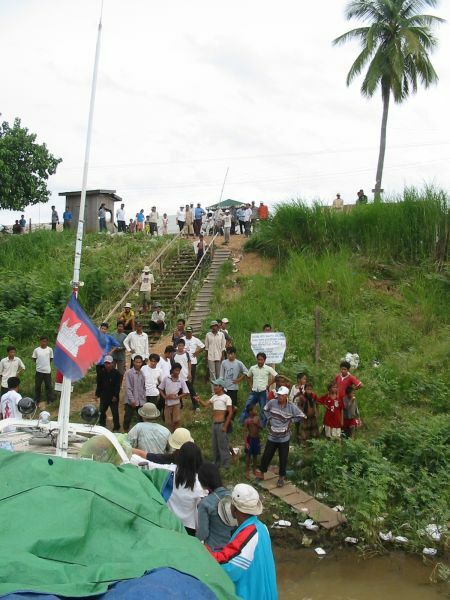 This is how it looks like in Kompong Cham. 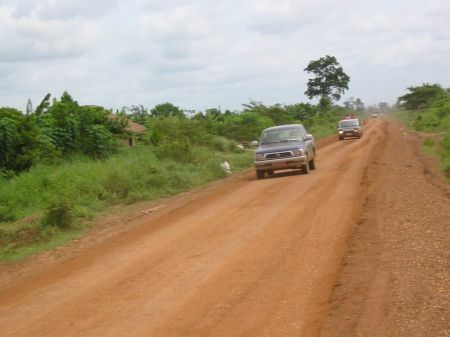 There are many plantations of rubber and timber. Those are the last cars of about 15 trucks accompanied by police cars. You donâ€™t get to see police cars in the countryside very often and not in such high numbers. My co-traveler indicated this might have been Prime Minister Hun Sen himself. This is how it looks like in our vehicle. The guy to the left in the very back is from Israel. We got to know him during this ride and met him later several times in and around Banlung. 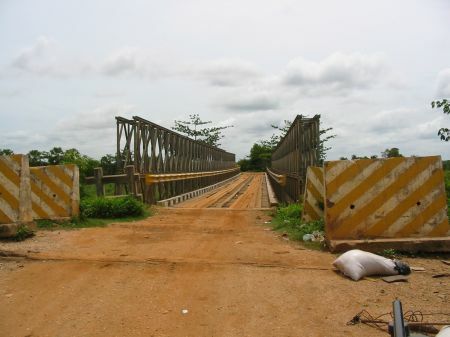 We crossed a number of bridges which where mostly constructions similar to this one. 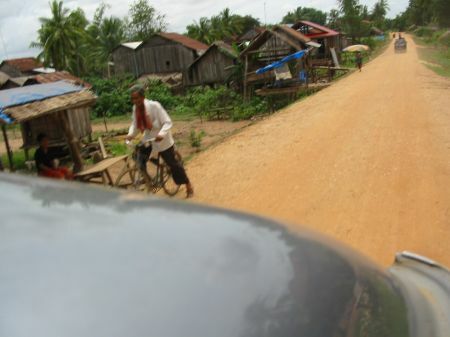 Those are pictures randomly taken with my camera out of side from the top of the car somewhere in Kratie Province. 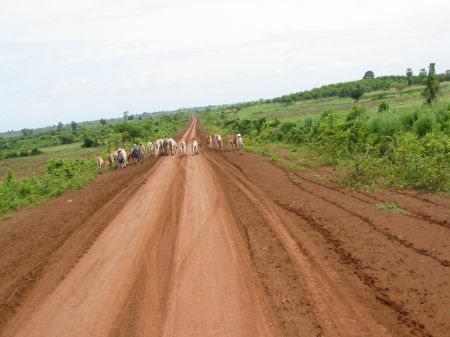 This â€˜read soil roadâ€™ is not the main road but some sort of shortcut. Once in a while we pass a settlement of very simply shacks. 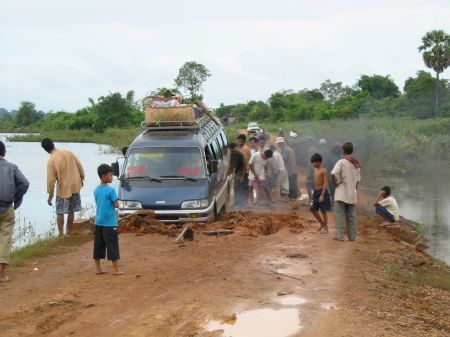 A truck had damaged the road and local people came to repair it. We were able to pass after only a few minutes of waiting. 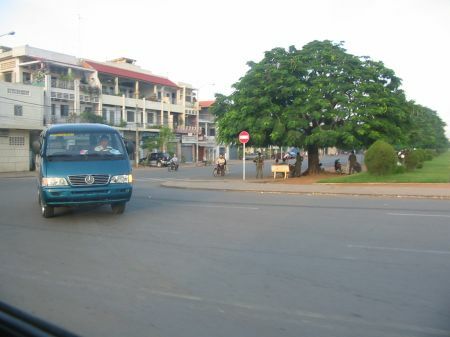 We arrived at the port of Kratie at about 11:30. 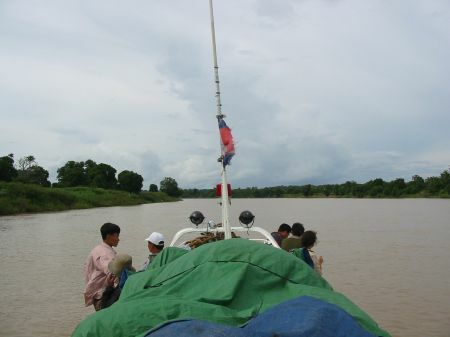 We learned that a speed boat to Stung Treng would leave at 12 and we managed to get tickets for 5$ (Khmer) respective 8$ (Foreigner), I believe. I was impressed to find this boat. It looked fast to me. Almost like an airplane. However, I was glad that this vehicle would not loose contact to the fluid ground. 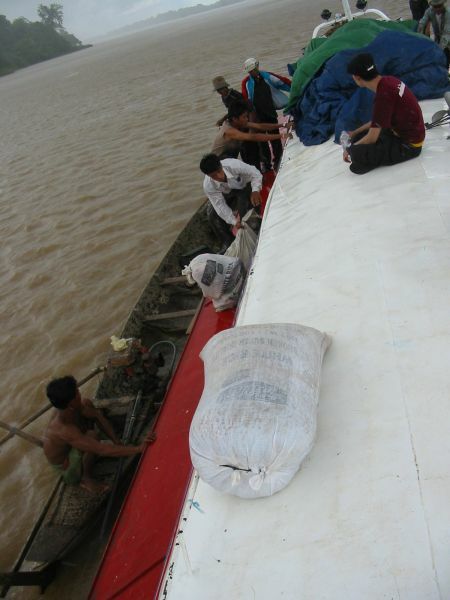 Most seats in the boat were already occupied and I found it to be a privilege that we could travel on the roof. 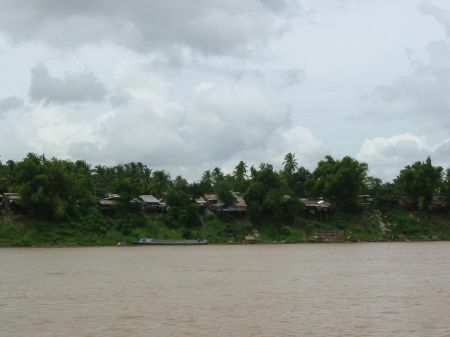 Those are settlements along the river. There were a number of bigger ships as well, mostly wooden ones. This picture shows a very specific weather phenomenon which I have not seen before. We are aiming at an area with very heavy and dense rain. This rain however is limited to a very small area and its boundaries can clearly be distinguished. 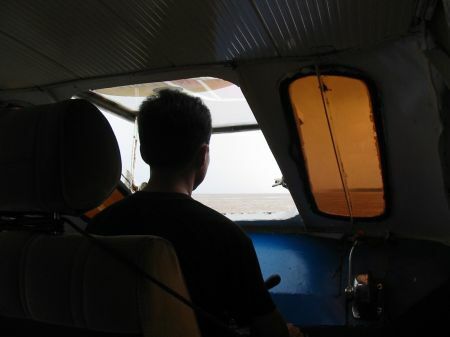 This is the cockpit of the boat. I got myself a seat because I did not feel like having a shower. Moreover it became sort of stormy outside. Inside this boat is not so much different from an airplane. This is the rain front from the other side. 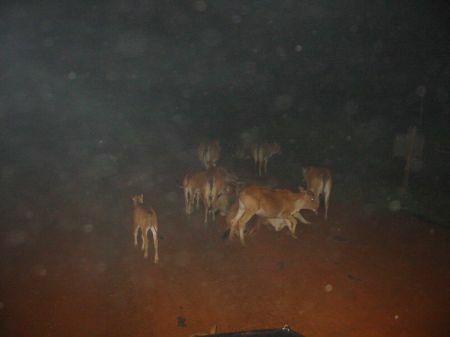 We hit a good number of them before we reached in Stung Treng. The boat is actually quite fast and reasonably comfortable. 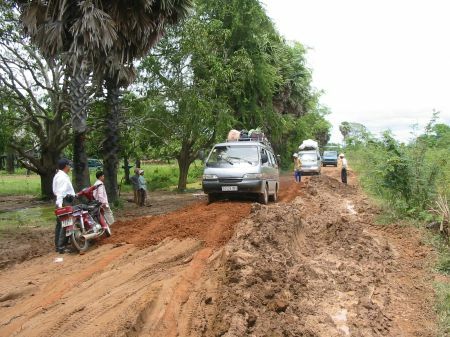 I heard this is particularly true when compared to the road, which is the other option for traveling from Kratie to Stung Treng. After maybe one hour we reached this settlement, which I could not find on any map in my tourist guide. 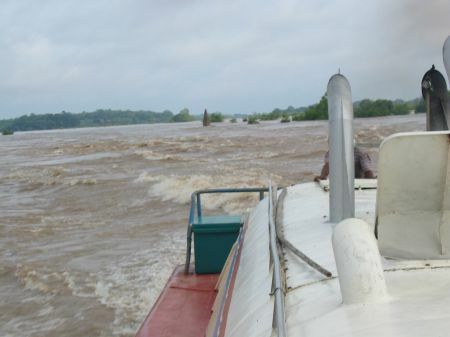 The course of the boat was not steady and obviously the captain tried to avoid hitting the ground. I tried to figure out pattern in how he was steering the boat, but could not identify any. 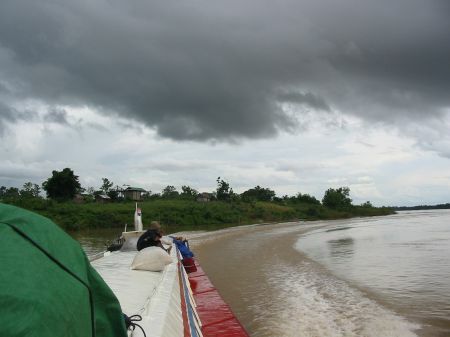 However, most of the time we were traveling very close to the main land. 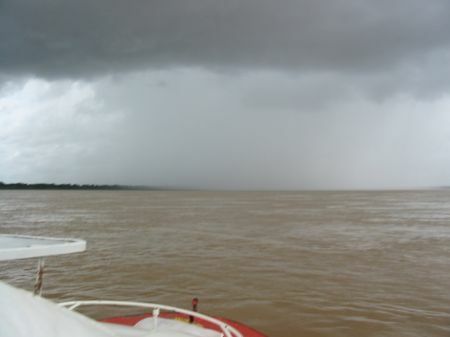 It is about to rain again when we meet this boat. This happened a number of times to pick up passengers or discharge goods like chicken (more or less alive) or a spin for those long and slim boots. Again, we travel most of the time close to one or the other bank. 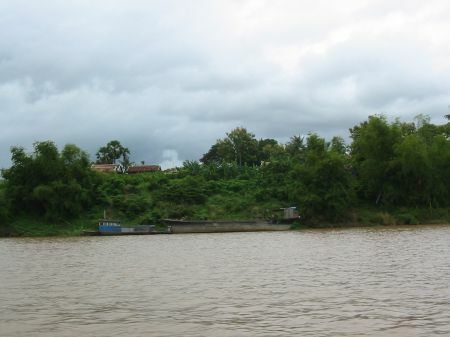 Frequently we pass side arms of the Mekong. 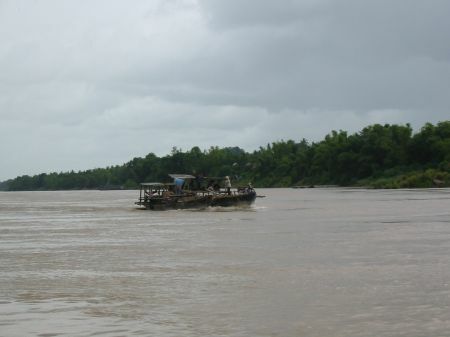 We pass those bigger wooden boats shortly before we arrive in Stung Treng. 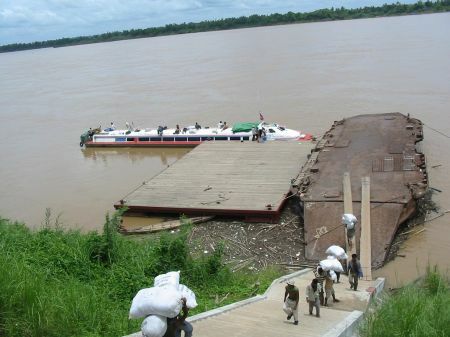 I have seen this sort of boat earlier close to Phnom Penh discharging wood. What seems to happen here is that they are loaded with something, most likely timber. 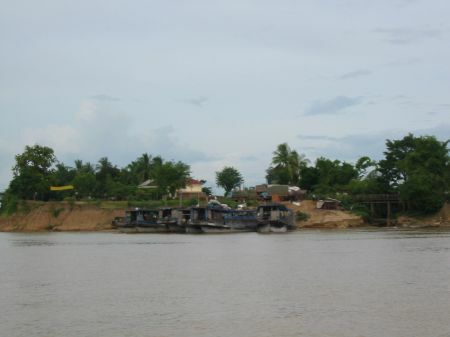 This is when we arrive in Stung Treng. 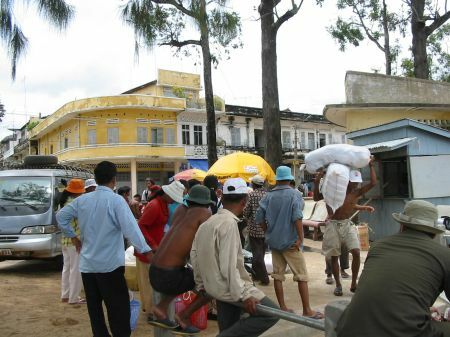 A good number of people are waiting to promote guest houses and transportation or to sell snacks to travelers and carry cargo. Given this situation it does not generally appear to be a problem to find accommodation or a ride to the next destination. It is still not even late in the afternoon. 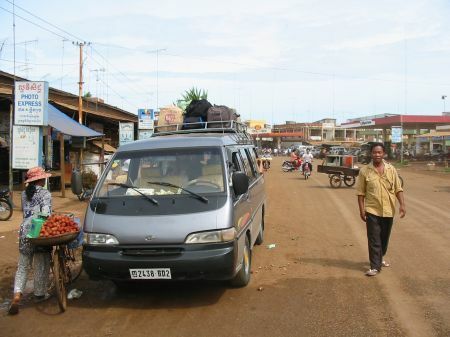 I was surprised how easy traveling to Rattanakiri actually turned out to be. 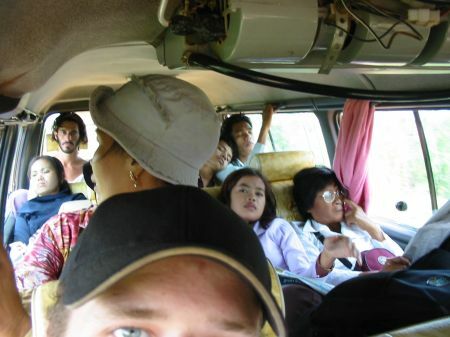 It did not take us long to settle for a ride on the back of a pick up for 5 dollar per person. We have company of those people. The fellows on the ride hand are Frenchmen. The guy to the left is the guy form Israel I mentioned earlier. We had good conversations about the relationship between France and Cambodia today, about the United States and the war in Iraq. This is how it looks like most of the time during the first part of the journey. 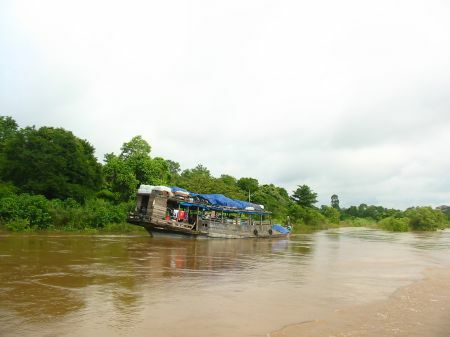 Later on we traveled through partly dense and almost impenetrable jungle. Another of those bridges. This exemplar is pretty long compared to most of the other bridges I saw. This is when we have a break. At this point we are already pretty much in the forest. However, we passed numerous clearings apparently created by mankind involving fire. Most of the time there is a small house on those clearings, housing obviously pretty poor people. The house in the background is pretty much the wealthiest house I have seen on the way. It is getting dark very quick. At this point a number of short rains showers had already hit us. It is a bit colder around here and together with the wind caused by the speeding car it becomes kind of chilly. 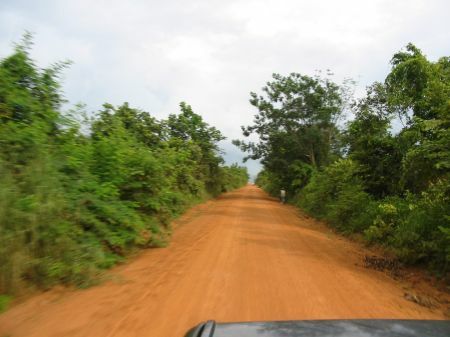 The quality of the road was pretty poor and we had a hard time holding on to the car. 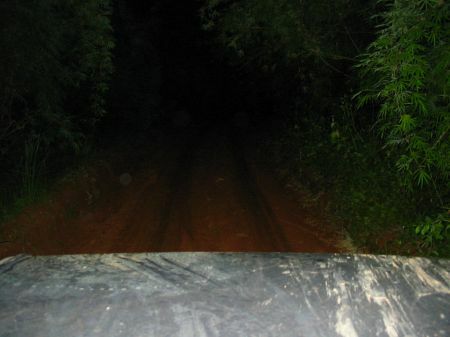 I tried to take pictures of the road using a small stand on the of this pick upâ€™s cabin. However, the flash is not strong enough. However, shortly after this shot it started to rain very heavy and did not stop. 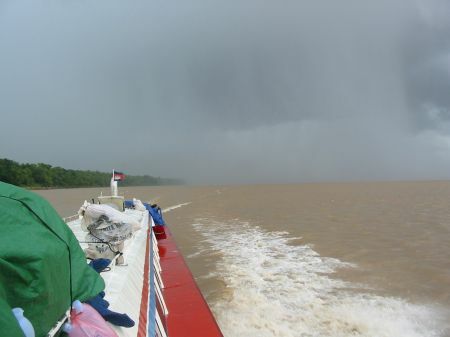 This was about the strongest rain I ever encountered. This was an interesting experience particularly on the back of a truck. I was happy to have rain jacket. Together with my sunglasses I was even able to open my eyes. However, I did not see much. The jacket did not prevent me from getting wet. This was like going for a swim in a rain jacket hoping to remain dry. However, it helped me not to become cold. 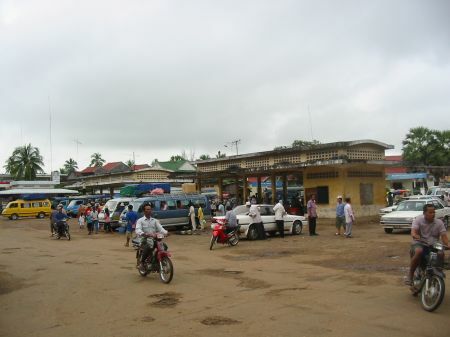 It was still raining when we arrived in Banlung, which is the provincial capital of Rattanakiri. This was at about 8:30 pm. In general I was surprised that we made it here during only one day.